Our group chose to evaluate the lighting qualities of the Gatewood lobby. 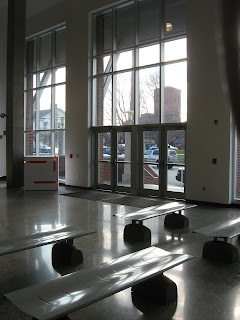 This area can also be considered the foyer or lobby for the Gatewood building. The facade of the entry area is a full glass window, stretching from the ground up to the ceiling. Alot of natural light fills the lobby area because of the large glass windows. A few focal lights can be recognized in this space as well.